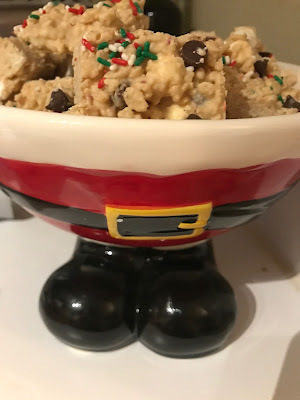 Today I'm sharing a delicious holiday treat! It's like a rice krispies treat for adults. Filled with white chocolate, peanut butter and marshmallows, it's sinfully delicious! 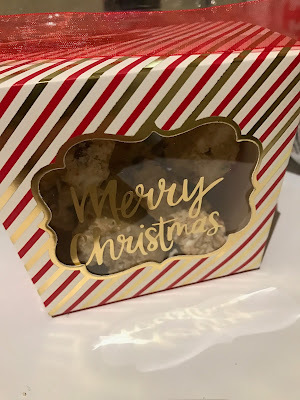 I had plans to make a different holiday treat, but my husband specifically requested this one to take to a holiday work potluck, and I decided I'd just go ahead and make enough to gift to the neighbors and take to my in-laws and my mom's Christmas parties! First, melt the white chocolate. I do this in the microwave, stopping to stir every 30 seconds or so. 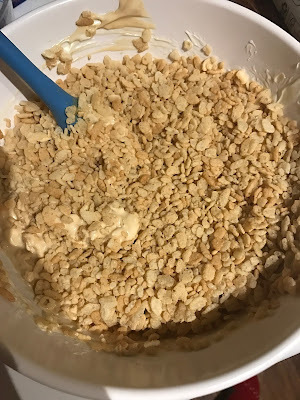 Once it is good and melted, add the peanut butter and mix well, then add the rice krispies. 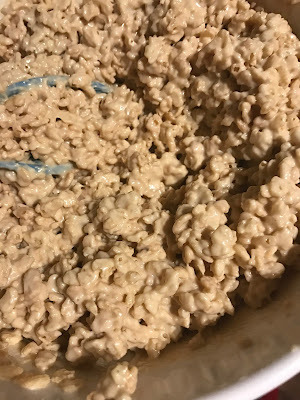 Once those are mixed in you can slowly mix in the marshmallows. At this point I throw about half of the chocolate chips in and some sprinkles. Next I lay this mixture out on parchment paper. I put my parchment paper on a cookie sheet but if you have a large, flat counter space that works too. 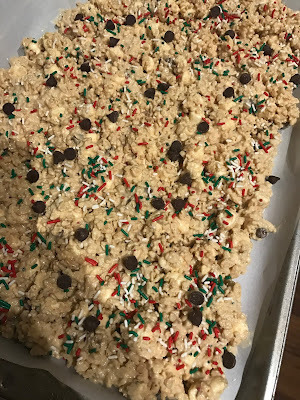 Once it's all flattened out add the rest of the chocolate chips and as many sprinkles as you'd like. Pat these in to the mixture just a little, or they'll fall off when cutting/eating! Now it just needs to cool and harden up a bit. Give it an hour or so, you can put it in the fridge for a few minutes to speed this process if needed. Once it has hardened, you can cut it. I cut it in to pretty small squares, just because it's pretty rich! 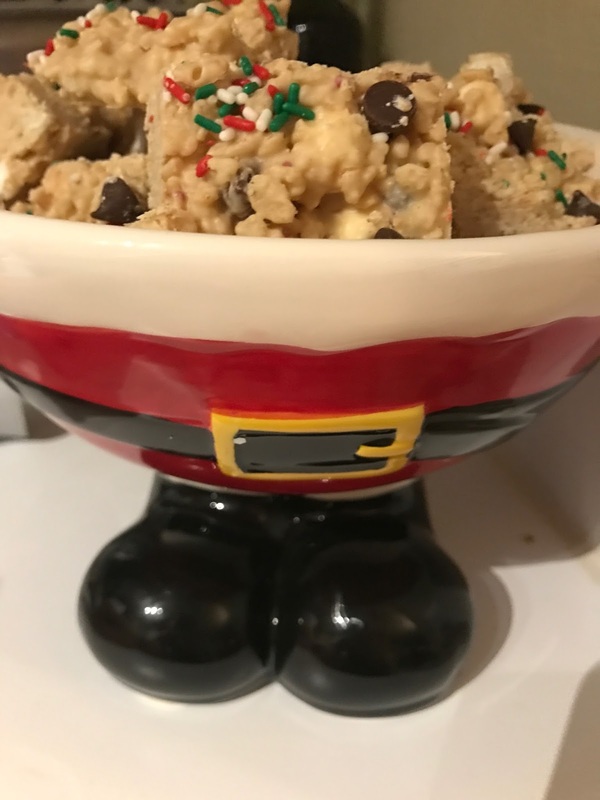 I put them in this fun Santa bowl to take to a Christmas party we are attending on Friday, and in these cute little boxes for the neighbors, and now we are officially ready for Christmas festivities to begin! Wishing all my readers a big Merry Christmas filled with lots of love, laughter, and wonderful memories! I'll be taking a break for a few days to enjoy this time with my family and friends! You'll hear from me more after Christmas! !